SA Gauge, a local manufacturer of temperature and pressure gauges, recently received the South African National Accreditation System (SANAS) accreditation conforming to the ISO/IEC 17025 standard for temperature calibration. “Customers that are already used to the quick pressure calibration turnaround times by SA Gauge’s accredited pressure laboratory, will now be able to get the same quick service on temperature calibrations,” says managing director, Chris du Plessis. 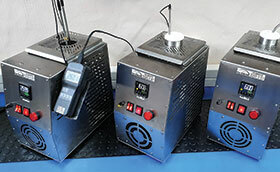 Having several heat sources permanently stabilised at dedicated, commonly requested set-points enables the laboratory to ensure quick turnaround times on thermocouples, PRTs and digital thermometers. dial thermometers, infrared thermometers and liquid in glass thermometers can also be calibrated. Trained and qualified metrologists working under controlled environmental conditions with highly accurate and stable equipment and standards, ensure all work is performed competently and on time, usually within two to three days. What does SANAS ISO/IEC 17025 accreditation mean? To achieve ISO/IEC 17025 accreditation, the laboratory’s quality management system and technical competence is regularly evaluated thoroughly by a third-party assessment body. Audits are conducted on a regular basis to maintain accreditation and to prove compliance. ISO/IEC 17025 accreditation can only be granted by an authorised accreditation body, such as SANAS, which is authorised by the Department of Trade and Industry in South Africa. Accreditation means that the laboratory has met the management and technical requirements of ISO/IEC 17025, and is deemed technically competent to produce valid calibration results. SA Gauge customers have the right to receive a reliable, accurate product – the company’s professional pride will have it no other way. In-house production and SANAS ISO/IEC 17025 calibration laboratories allow it to set high standards for quality control. Coupled with a ‘customer satisfaction at all costs’ sales team, a ‘results driven’ engineering team and a ‘first time right’ production team, customers are ensured of accurate, quality instruments made to their specifications at short notice. The in-house SANAS ISO/IEC 17025 accredited laboratories then ensure that customers are left with the same level of confidence in their equipment after recalibration, as when it was new.